My current plan is to use fantasy Orcs of the correct vintage, but, of course, they’ll all need converting to some extent. With that in mind, I’ve been playing around with press-moulding bits so I can produce the correct weapon options for these sods… I have had very little success so far, but I will persevere… You can say what you like about this sanity of tackling this project with such strict self-imposed restrictions, but it is definitely developing my hobby skills! 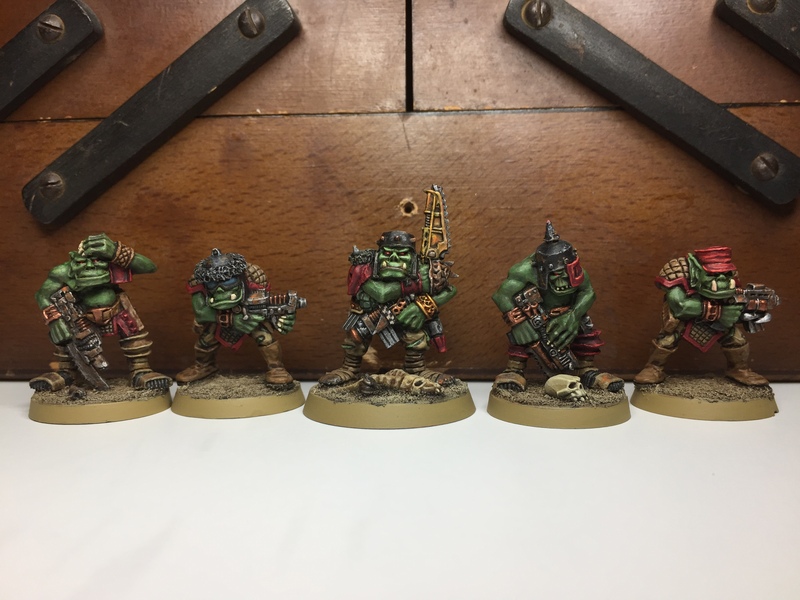 I’m happier with these guys than with the first few skwads – I forgot to take a green glaze with me on holidays so didn’t use it on the first batch of Ork skin, but I tested it on these guys and am much happier with the resulting tone… I’ll have to remember to go back and glaze the others! Also, I cheated a bit on this unit – the leader (Thrug Bullneck no less!) was already painted on hols, but I re-did his trousers & shirt to tie him in with ‘Red Skwad’ a bit better, (and I also glazed the flesh). 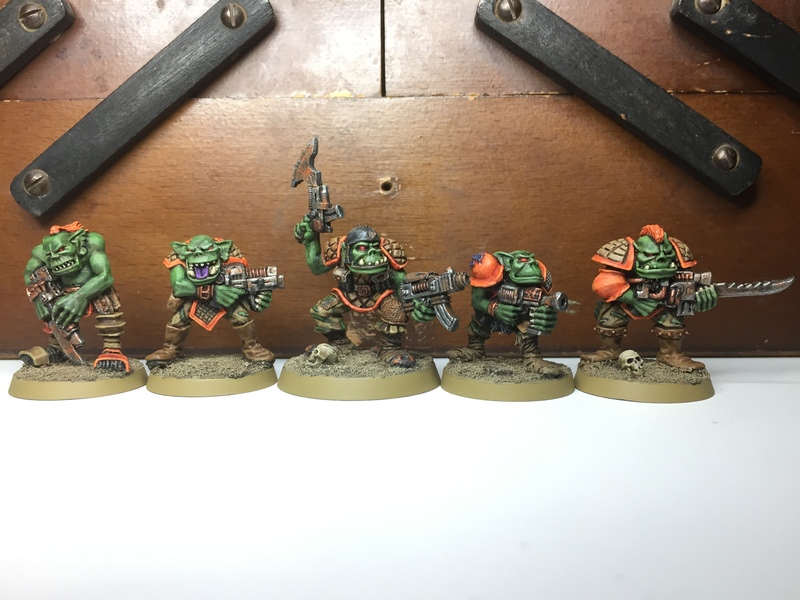 I also had a look ahead to some more units that are needed for the scenario – the Ork Guard Units. 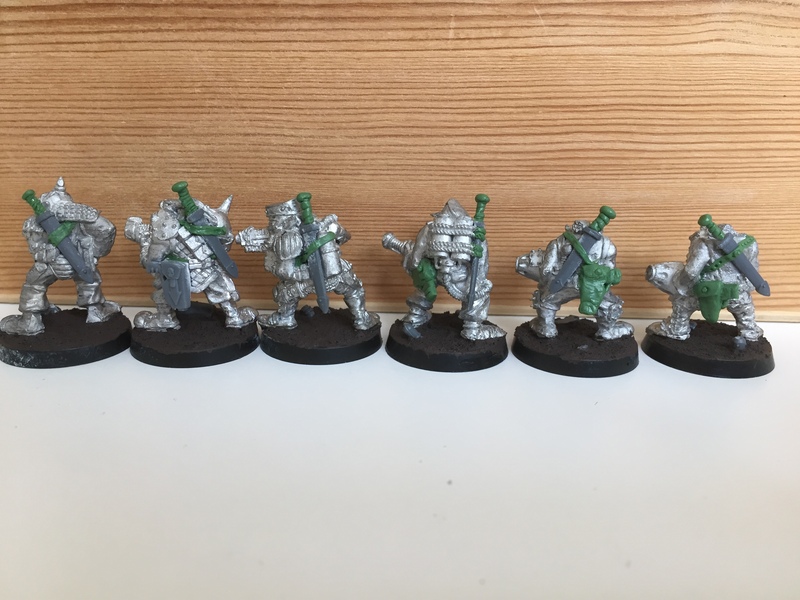 These Guards are a bloody pain in the arse… They are meant to have Power Armour, Bolt Guns & Chainswords – all fine and good, except I can’t find a single OldHammer mini that matches this equipment loadout! All the Power Armoured Nobs of that time have Power Gloves, and all the sculpts would be really tricky to weapon-swap on in a convincing way… I could go for some newer Ork minis, but I really don’t want to deviate from the era too much. It’s a pickle, and one that I’ve been mulling over for several weeks now! Hmmm… I am both pleased and frustrated at the same time – pleased that the basic shape is there, and happy that it clearly reads as “Hey fuckers, look at me! 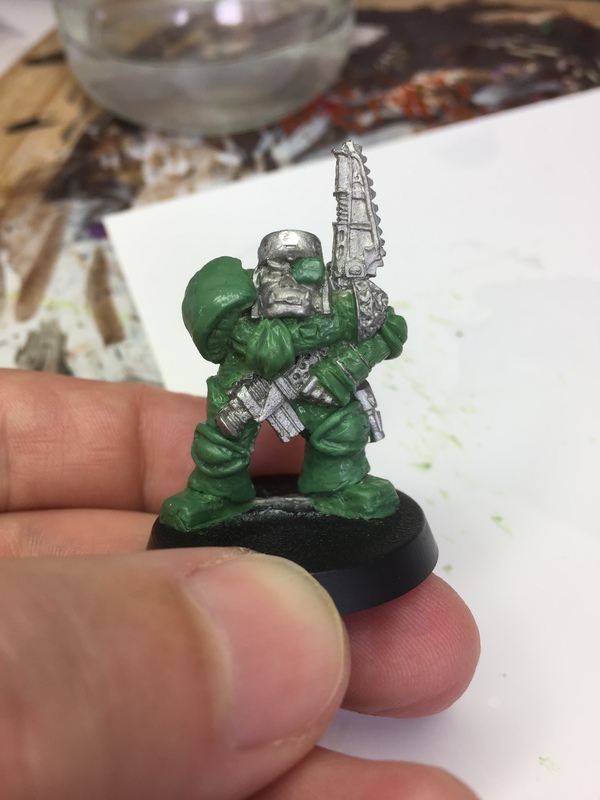 I’m that mythical non-existent Power Armoured Ork with Bolter and a Chainsword that Rick Priestley wrote into the Wolf Time campaign!”, but I’m also frustrated that it is so rough. Of course, it isn’t finished yet, but I’m in totally new territory here – I’m not sure how much I can refine it, whether it should be more refined now, how to add stuff, etc. I’m basically learning as I go, and have no idea were to pitch my expectations – the uncertainty is somewhat uncomfortable. Also, I’m thinking of the bigger picture – I need 19 of these buggers! 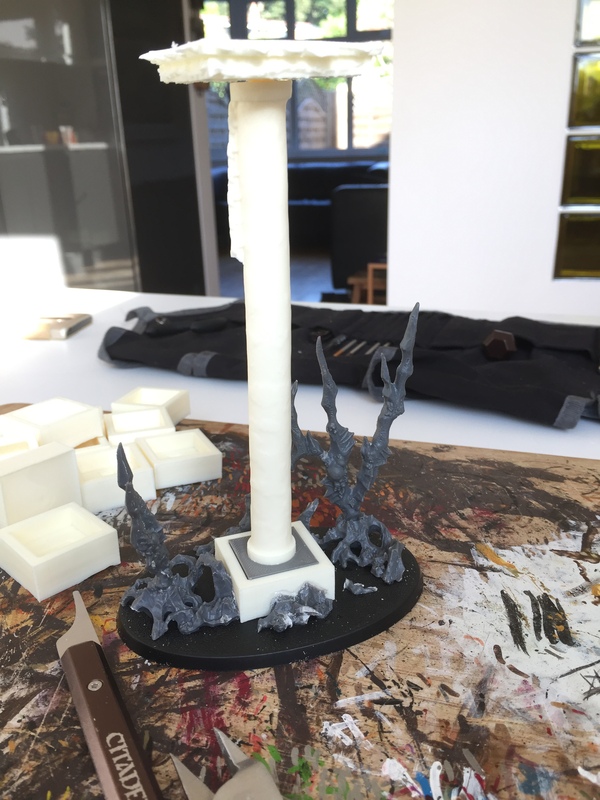 19 re-sculpts will take me bloody ages, and I run the risk of them all looking like kneeded dog shite at the end of the process… on the other hand, my sculpting will have improved hugely, and they might end up looking absolutely awesome… Decisions, decisions! Anyway, that’s it for today – catch you homies all on the flip-side!